Skillsoft conducted a survey to compare the traits that defined 20th century leaders with the characteristics of their 21st century counterparts. Not surprisingly, the 21st century leader must be more flexible, collaborative and creative than his or her predecessors. While many organizations understand how leadership is changing, their cultures have not yet adapted to encourage these new leadership traits. This paper provides actionable techniques for developing a culture that fosters innovation and encourages 21st century leadership methods and mindsets. 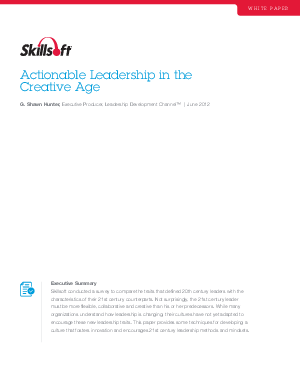 Download Actionable Leadership in the Creative Age and learn how to foster the right leadership traits within your organization.